Frogs are unique among the Kansas herpetofauna, because their vocalizations allow us to detect and identify them, without ever having to hold (or even see) them. Chorusing frogs, offer the first opportunity for the herpetologist to venture afield each season. Armed with a flashlight and old tennis shoes; any rainy night from February to September, may initiate chorusing in one (or more) of the 21 species of Kansas frogs. 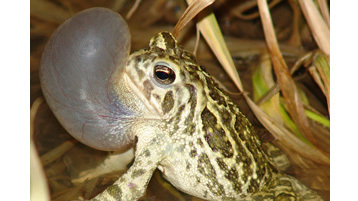 Chorusing (unlike other frog vocalizations) is carried out by males exclusively and probably serves to attract females to a suitable breeding site, thereby facilitating reproduction. The Spring Peeper is the first to begin each year, and the Chihuahuan Green Toad most often the last. In western Kansas, chorusing is more dependent upon the lack of precipitation. It is not uncommon for a local population of frogs to not breed for one or more consecutive seasons; until conditions are favorable again. You can find out more about the chorusing natural history for each species, in their individual species accounts (link above). The figure below displays real-time quartile plots of chorusing activity for all Kansas frogs in which six or more observations have been recorded in the KHA database. The taxa are listed alphabetically by their Standard English Name, and followed by the number of observations in parentheses. The black dots are the actual Julian date (day of the year; 1 January = 1 to 31 December = 365) observations were made. The thin red line depicts the range of dates between the beginning of the first, and end of the fourth quartile (excluding outliers; Tukey method). The thick light blue bar represents the second and third quartile (interquartile range; the middle 50% of all observations). Only one observation per Julian date is included in the graphs; so a date with multiple observations carries the same weight as a date with only one observation. The vertical bars correspond to the 12 months of the year; January through December.